Our primary service markets include wireless SCADA applications for the Municipal Water -Waste water sector, and, Electric utility automated distribution switching. IP based communications systems today incorporates multi-level protocols in providing monitoring, control, video surveillance, voice and remote or mobile monitoring and control systems. Ten years’ experience and focus has led to developing our skill set to a level of providing an unparalleled level of quality and service with mission critical wireless applications. Our skill set has grown to include hybrid communications systems including VHF, UHF, SHF, Cellular, fiber optic and satellite communications. 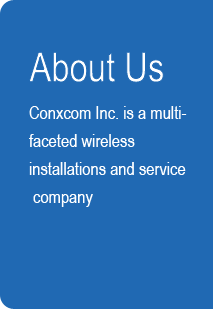 Conxcom Inc. can provide analysis, network design, equipment supply, turnkey installation services, testing, and field commissioning. 2015 marks completion of the York Durham South East Collectors project. The 3 year project involved 16 wireless SCADA links installed at key York and Durham sites providing monitoring and control of the state of the art trunk sewer system.